Tokyo (AFP) – A sleek “Hello Kitty” bullet train festooned with images of the global icon from Japan began services on Saturday, drawing hundreds of fans to its opening ceremony. 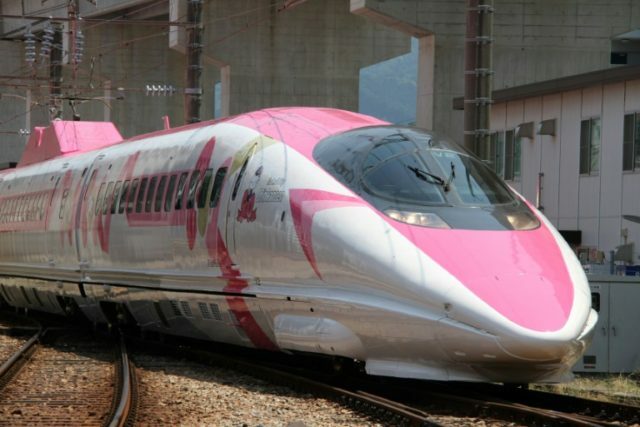 The special white and shocking pink shinkansen or bullet train departed from Hakata station in Fukuoka for Osaka, waved off by a conductor dressed in a Hello Kitty outfit — complete with the character’s trademark pink ribbon — and watched by a crowd of some 400, according to local media. The train will run for the next three months between the western cities of Osaka and Fukuoka, the West Japan Railway Company said, hoping that one of the country’s most famous exports will boost tourism. Inside the train, Hello Kitty smiles down from the shades of every window, while one car features a “life-sized Hello Kitty doll” for fans to take selfies with. Another car will have no passenger seats but offer regional specialities, including a selection of goods and foods, in a bid to boost the local economy and tourism. Hello Kitty has spawned a multi-billion-dollar industry since Sanrio introduced it in 1974, adorning everything from pencil cases and pyjamas to double-decker buses and airliners. In 2015 the West Japan Railway Company unveiled a “Hogwarts Express” Harry Potter themed bullet train that ran between Osaka to Kagoshima in western Japan.